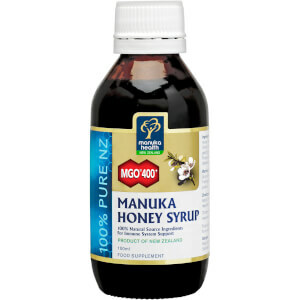 MGO 400+ Manuka Honey Syrup is a great tasting natural formula designed to soothe and support the throat and chest. The syrup is formulated with a combination of high grade MGO™ 400+ Manuka Honey, BIO30™ NZ Propolis and herbs, popular for their ability to provide respiratory and immune support. MGO™ 400+ Manuka Honey is 100% natural and has effective and reliable antibacterial properties due to the naturally occurring, active compound Methylglyoxal. Shake the bottle of Manuka Honey Syrup thoroughly before each use. Adults: 10ml (2 teaspoons) 1-4 times daily. Children over 2yrs: 5ml (1 teaspoon) 1-4 times daily. MGO 400+ Manuka Honey, Rewarewa Honey, Peppermint (Mentha Piperita) Extract, Wild Cherry (Prunus Serotina) Extract, Licorice (Glycyrrhiza Glabra) Extract, Thyme (Thymus Vulgaris) Extract, Propolis Extract, Blackcurrant Flavour, Peppermint (Mentha Piperita), Essential Oil.